This is a sparsely populated part of Suffolk, the rolling landscape with its fields and copses punctuated by the occasional settlement. 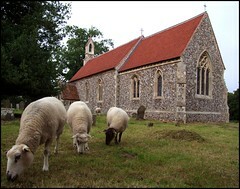 The medieval parish churches are often remote, and Sotherton's is no exception. There is a footpath to it marked from the Halesworth road, but on the one occasion I took it I ended up lost in a farmyard, and ended up having to go the long way round. A narrow lane rises up from the Beccles road, and it was with some surprise in October 2018 that I cycled up this to overtake a man struggling to push a cement mixer. He stopped for a rest, and we said hello. I asked him if he was alright, and he said he was, or at least he would be when he got it to the top of the rise. This was where the church was, and the lane finishes just beyond it, but I saw him carry on with his cargo, so I don't know where he was going. There is no village. Even the Parish of Sotherton is too small to be marked on anything but a decent Ordnance Survey map. The only other buildings in sight are a cottage on the edge of the churchyard, and an old farmhouse beyond. The farmhouse's position in relation to St Andrew gives it a proprietorial air, and you feel that in times past the church might actually have been an organic part of the farmyard complex, as at Letheringham. The fields lift around to enfold the little church, and when the corn is as high as a cyclist's eye it gives an intensely secretive feel to the place, as if something buried deep in the past is hidden here. If you come here while the harvest is in progress it can feel as if the land is being stripped back to reveal a profound secret. This charming little church was completely rebuilt by the Victorians. 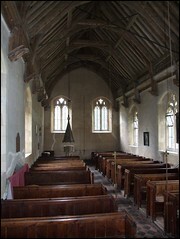 But they reused the old materials, and at any rate this is a church worth visiting. It is a fine example of good 19th century rural work. The architect was Henry Ringham, most familiar from his superb wood carving in the Ipswich area, particularly at Woolpit and Great Bealings. He built the fabulous Gothic House in east Ipswich, but went bankrupt before he was able to take up residence. However he was still considered a significant enough Ipswicher at the turn of the century to have a road named after him. 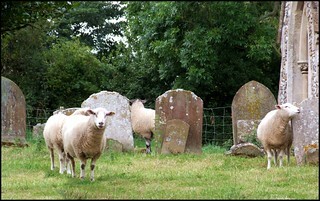 I was disappointed to find the churchyard devoid of sheep. 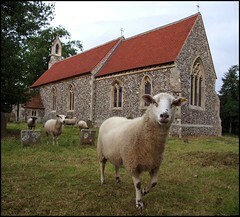 On one memorable occasion I had arrived here to find the church playing host to a flock of the friendliest and most inquisitive sheep I have ever encountered. They rubbed themselves against me like sleek cats, and generally did all that they could to get in my photographs. I spent longer looking at the outside of the church than I did the inside, and quite missed them when I had to cycle off in the direction of Uggeshall. 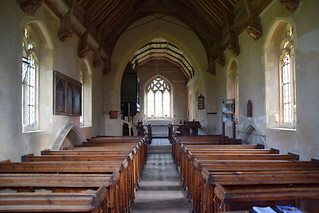 For such a quiet and unassuming church, without a tower or a prominent position, St Andrew is full of interest. It has at least one surprise, and one great treasure. 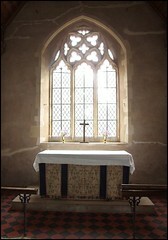 This is a pair of surviving panels of the roodscreen. They are attached to the vestry door. 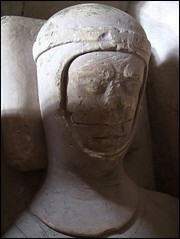 Although they have clearly been overpainted, they retain their 15th century gessowork (plaster of Paris attached to wood or stone, and then painted). More remarkably, St John is accompanied by his symbol of an eagle. 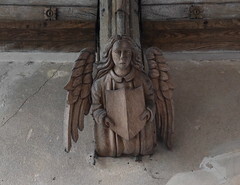 This is one of only two times this symbol is known to survive on a roodscreen panel in East Anglia. There are other medieval survivals. 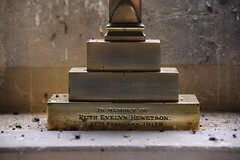 The font is a good example from the eve of the Reformation, with a hint of the elegance which the English Renaissance might have brought if we had not chosen the Puritan path instead. 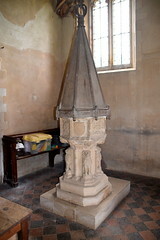 The blockish early 17th century font cover is a rustic contrast.The surprising survival is the 13th Century effigy of a knight, sleeping soundly in a recess on the north wall. The matching recess on the south side is empty, but is was probably simply a Victorian affectation to have two of them. 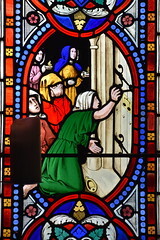 The 19th Century glass is singular. It is an unusual collection. Although it must date from the 1850s, some of it appears earlier, because of its pre-ecclesiological style. Perhaps that is simply because this is such a backwater. There has been some confusion about the workshops involved, but James Bettley revising Pevsner teased out the details. The most striking window, depicting the Ascension of Christ and the Day of Pentecost, is by the Liverpool firm of Forrest & Bromley. 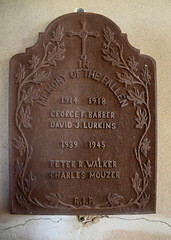 In a similar style on the other side is the Transfiguration by Ward & Nixon. 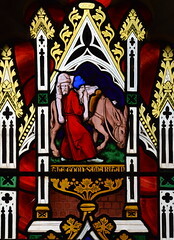 The Pentonville workshop of Charles Hudson was responsible for the window depicting St Andrew and the Good Samaritan, his also the Wise and Foolish Virgins sequence. Another period piece is the painted reredos, now reset on the north nave wall. 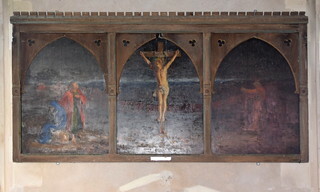 It depicts a sparse crucifixion, and was made for the church by Laurence Carrington Grubbe, and installed here in 1903. On this beautiful sunny day in late October, the church was full of light, the stone and wood dusty, the plaster crumbling. A rough and ready place to be sure, but with a sense of its past and a feeling that it is still watched over by its present custodians. 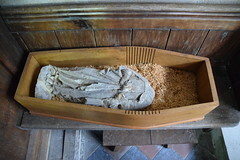 An odd addition since my last visit was a child's coffin in the chancel with (I kid you not) a headless statue inside it. I'm not sure what that is all about. 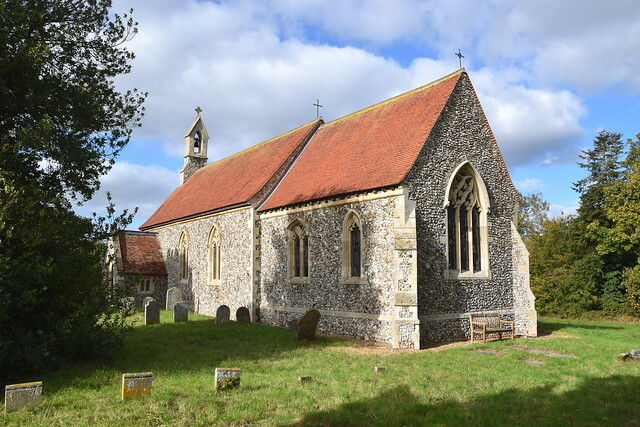 Munro Cautley was harsh about St Andrew, reviling its 19th Century rebuilding, and of course it is an insignificant church in comparison with the remarkable treasure of nearby Westhall. But I think this church is lovely. What's more, it is still in use, welcoming to strangers, and a delightful survival of the sentiments and impulses of our recent ancestors, just out of sight.